As many as 70% of all young people have experienced some form of bullying and one million young people are bullied every week, inside and outside of school (Young Minds). 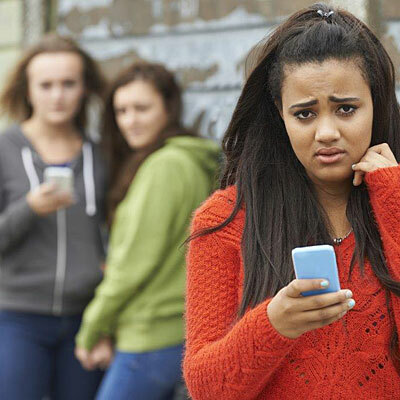 Bullying can happen to anyone at any age and can occur due to differences in class, race, religion, gender, sexuality, appearance, behaviour or ability. Let someone know what is happening. Bottling up what is happening is not healthy. It can make you feel more scared, more alone and more helpless. If you cannot tell someone, try writing it in a note or a text to someone you trust. A problem shared is a problem halved. Counselling is very useful to explore your thoughts. Who do you think you could tell? Bullies want to see a reaction. If you don’t give them one, they will get bored and eventually give up. Concentrate on using your face and body to make it seem as if you are not bothered by what they are saying. (How would you look ‘not bothered’)? Concentrate on your movement to make yourself look confident as you walk i.e. straight back, shoulders back, big steps away. (How would you move if you were confident)? Concentrate on using a calm voice to either a) use assertive language ‘Please don’t speak to me like that’ and keep repeating it if they continue. b) use fogging ‘That’s your opinion’ or ‘whatever’ and keep repeating it if they continue. (How would your voice sound if you were calm)? What reactions do you think you should avoid if you want bullies to get bored? It is really important to help yourself keep safe. Don’t think that you are on your own. There are people at school you can trust like a favourite teacher or school counsellor or friend. You could also join clubs or ask teachers if they need help with their classrooms or friends you could ask to stay near you at lunch/break. Who do you think you could ask? Being bullied can make you feel very lonely and you might think you don’t have any friends but they are out there. You’re likely to find someone who is going through the same as you who has to spend break/lunch on their own. Keep your eyes open. If you see someone else on their own try to start a conversation, about anything. You might try asking them what they did at the weekend and if they saw a particular TV programme, do they have any pets, brothers or sisters etc. Who do you think you can make friends with? What can I do if I am the bully? If you are bullying someone and want to stop but don’t know how, please speak to someone about it. You can ask to see your school counsellor and you can also arrange to speak to one of Youthline’s counsellors. Being bullied now does not mean you will always be bullied. You can have a happy and successful future. Nobody has the right to hurt you or make you feel bad. If you are being bullied you don’t have to deal with it alone. We are here to listen to you.